April 2016 - Pebbles, Inc.
Let your freedom ring as you celebrate your country pride with Pebbles’ newest collection, America the Beautiful. This patriotic line is perfect for yummy summer picnics, fun hometown parades, and stunning nighttime firework shows. Images of the stars and stripes, summertime treats, and classic American icons are presented beautifully in a traditional palette of cherry red, brilliant white and navy blue. 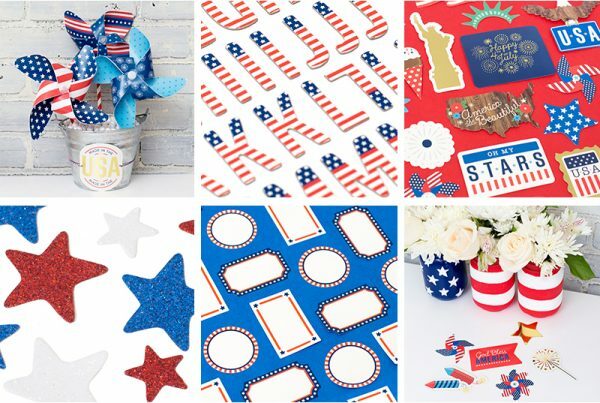 Dazzling icon stickers, coordinating flag Thickers, and self-adhesive glitter stars are sure to complement your celebrations and festivities perfectly. 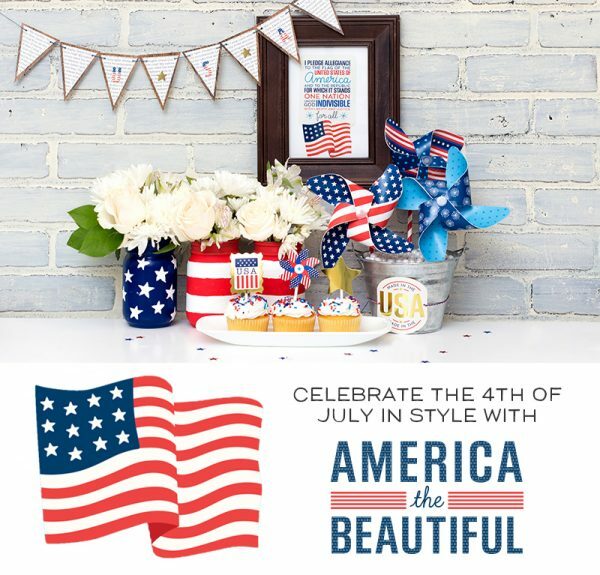 So get ready for summer fun and Fourth of July celebrations with our newest collection, America the Beautiful! We can’t wait for you to get your hands on this new line! 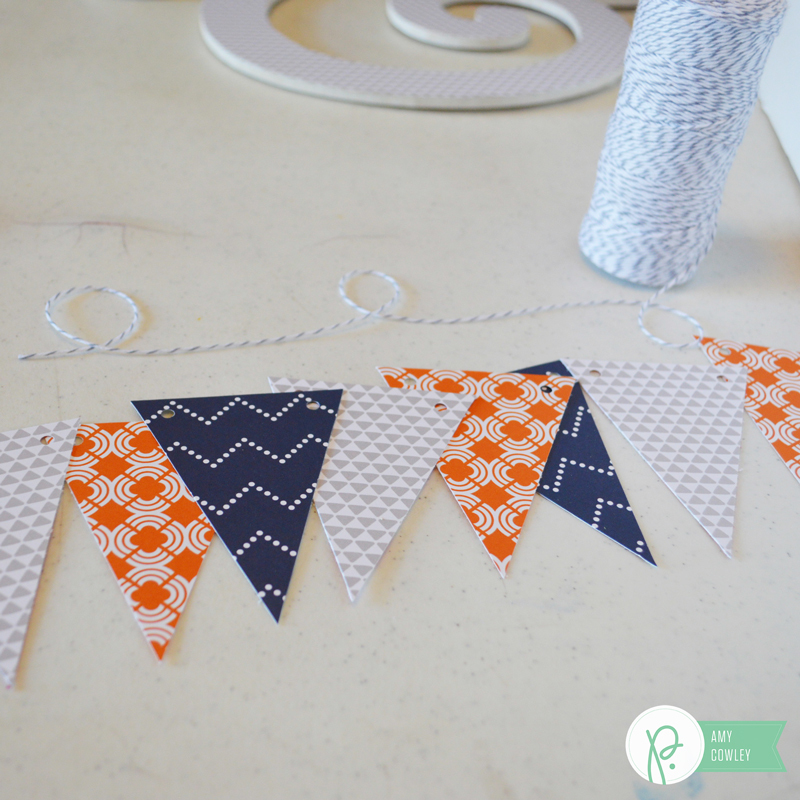 What fun goodies will you make for your summertime celebrations? Happy spring, Pebbles Inc. fans! 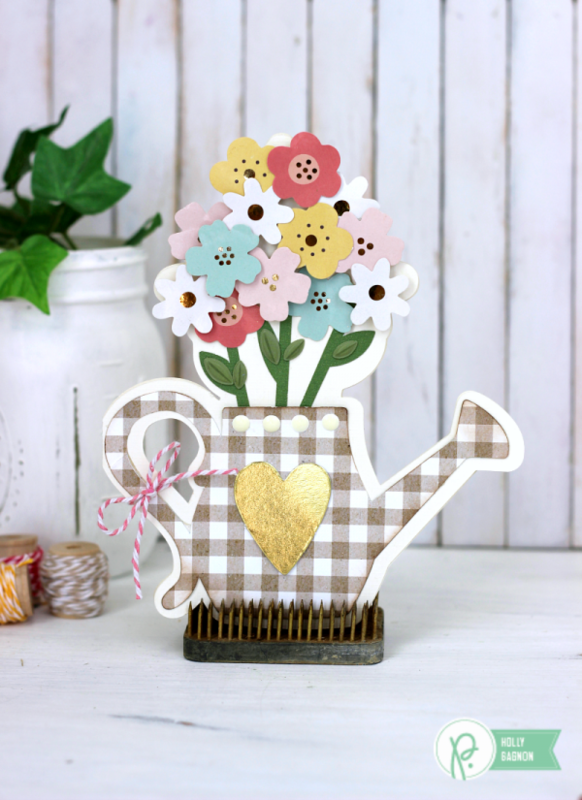 Holly here from Ribbons & Glue sharing a spring watering can card made with the Pebbles Inc. Spring Fling collection that hopefully inspires you to get outside and enjoy the weather. I don’t make as many handmade cards as I used to but when I sit down and actually make one, I really do enjoy it. 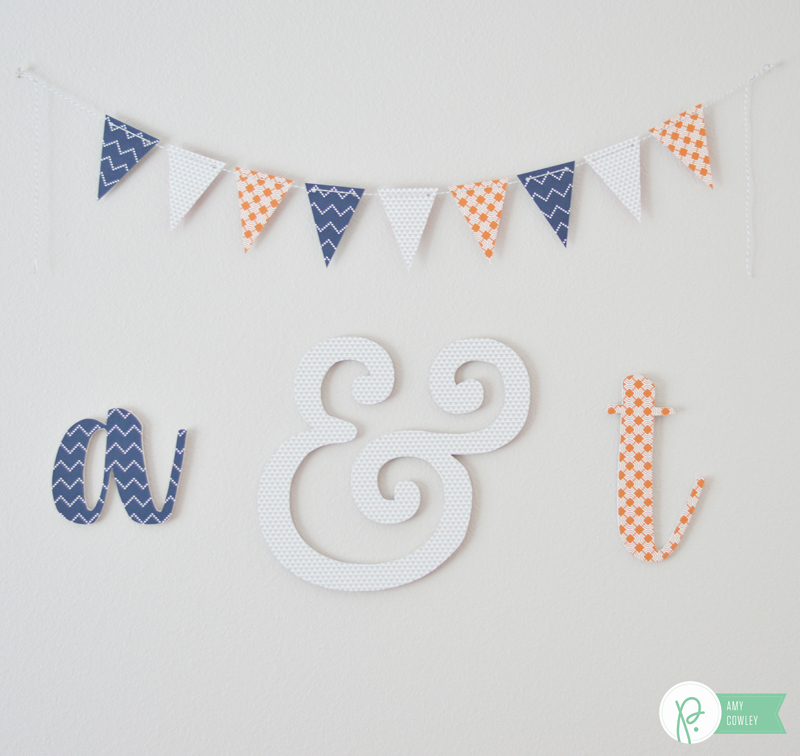 I just love creating things out of pretty paper, adding layers then adding pretty embellishments. The Spring Fling collection is totally full of all that too! 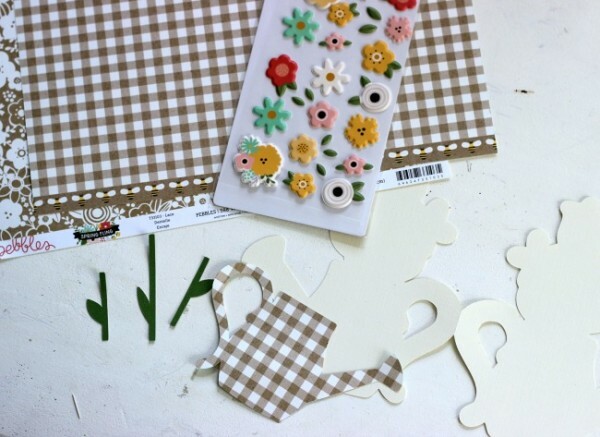 I used my Silhouette Cameo to cut out a watering can flower card cut file using off-white paper and Spring Fling patterned papers. 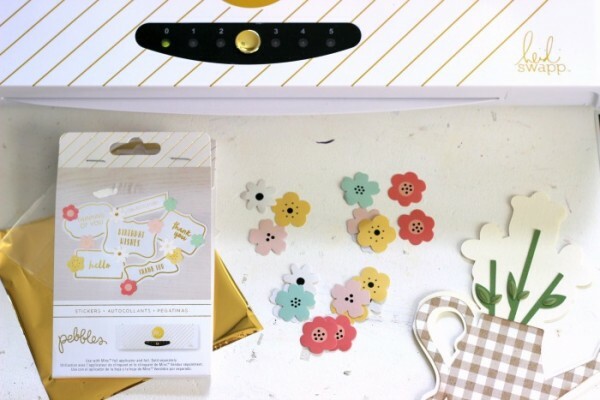 I mentioned before how I love adding pretty embellishments on to my cards, well the Spring Fling collection contains coordinating Heidi Swapp Minc Labels! I foiled the flowers with gold foil. So pretty! 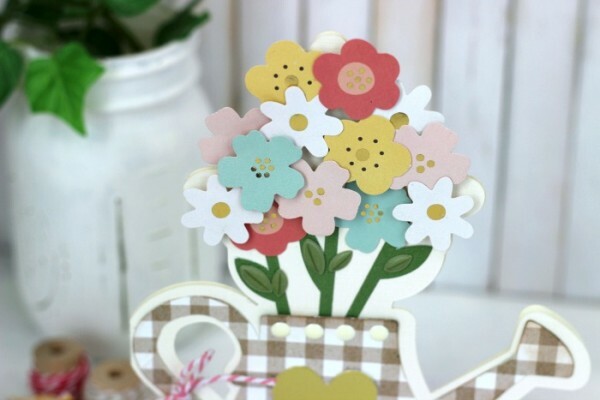 After my flowers had gold accents, I layered them on to watering can card using foam squares for dimension. 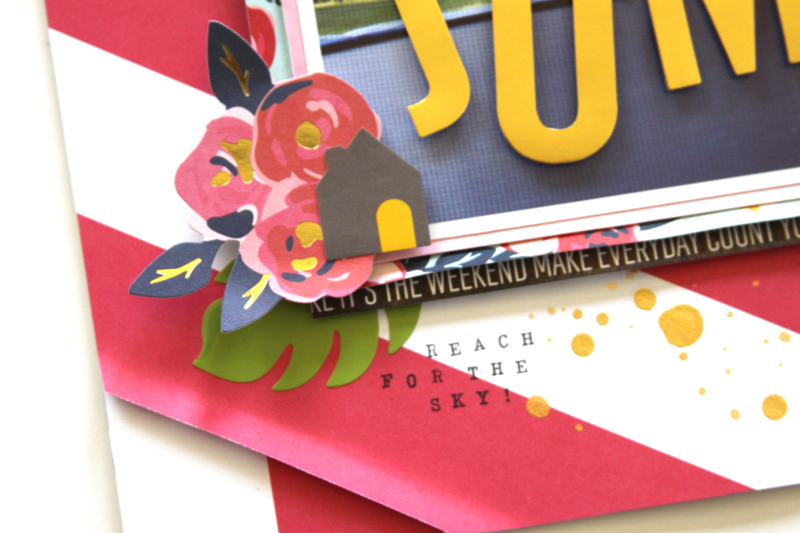 I also embellished the card with Spring Fling ephemera shapes and Happy Day epoxy stickers. 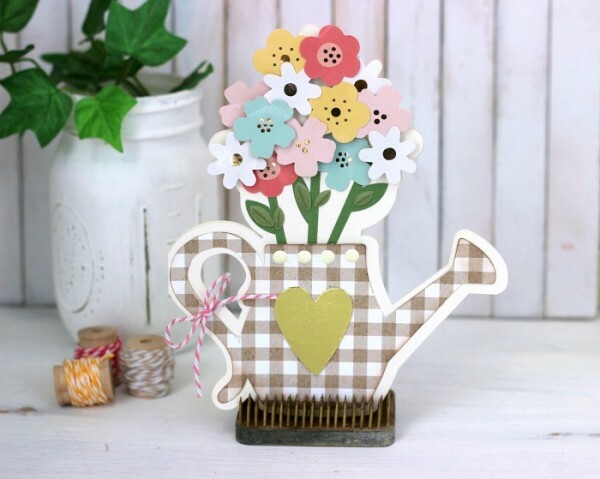 Now that sure is a pretty spring watering can! 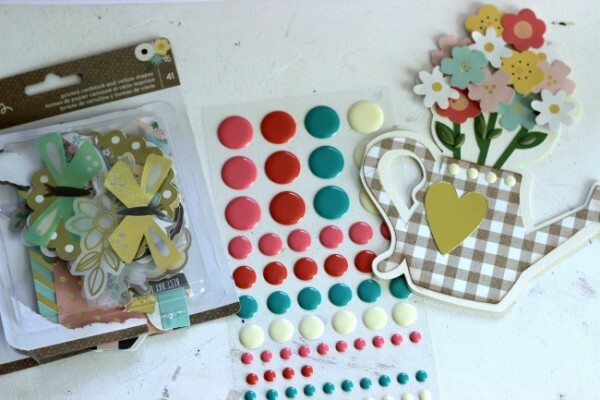 The Pebbles Inc. Spring Fling collection really does make creating spring cards easy. Hello friends! 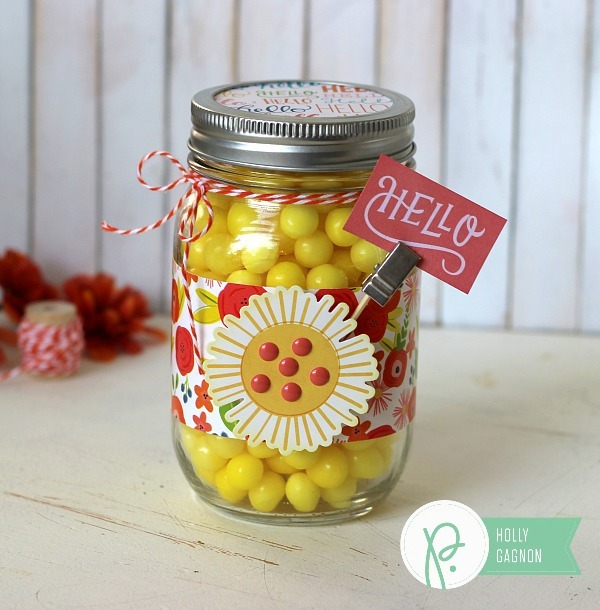 Becki here, to share with you an easy summer gift. I love summer just as much as the next gal, but the sun isn’t always my friend. I have red hair, green eyes, and very fair skin. Sunscreen is always welcome in my book. As the warmer and sunnier days come, I stock up on sunscreen and aloe vera. I have many friends and family who are also fair-skinned. 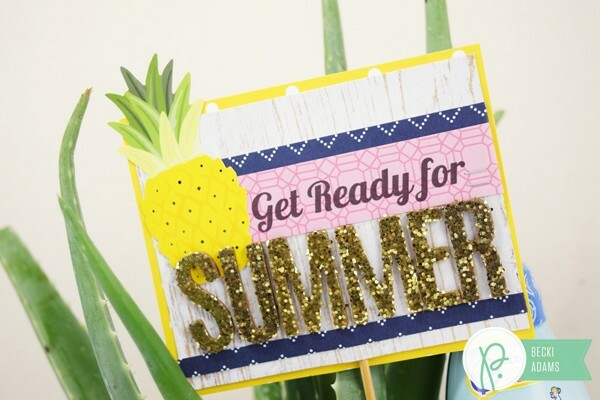 I thought it would be fun to pass along this great “Get Ready for Summer” gift. 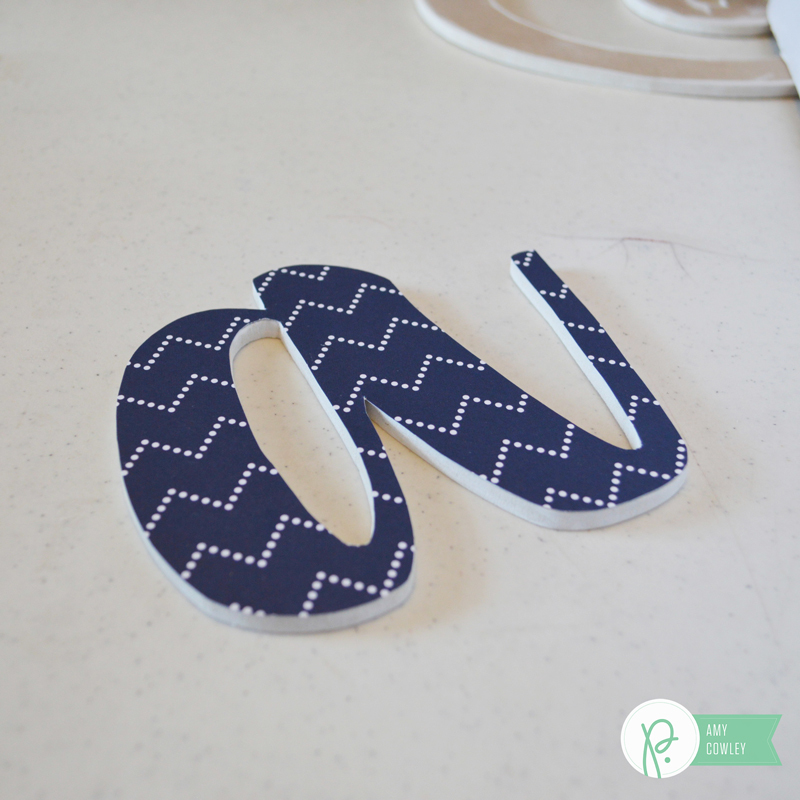 This summer gift was so easy to put together. 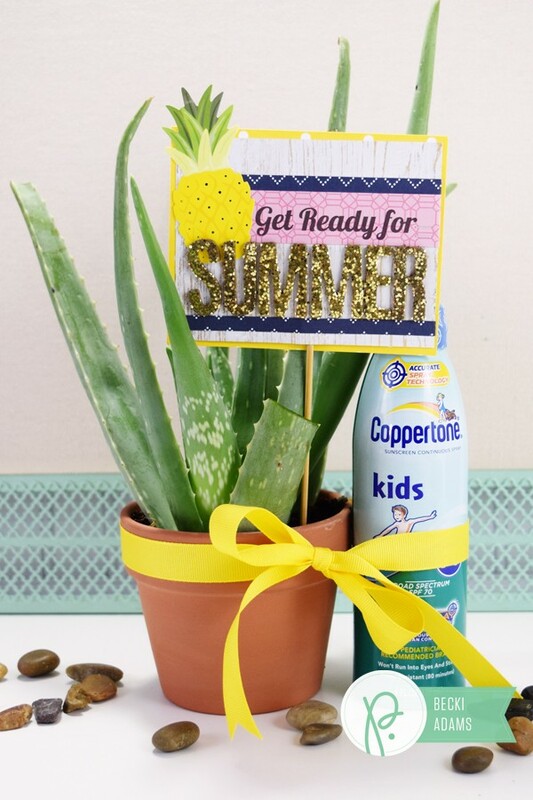 I made a tag from a few supplies from the Everyday collection and tied a bottle of sunscreen to a cute little aloe vera plant with a yellow ribbon. 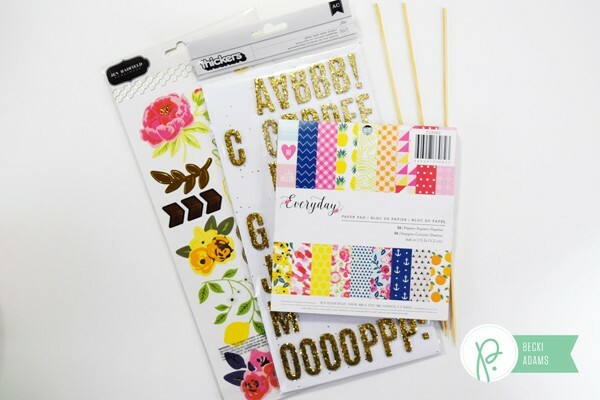 I created the tag with patterned paper from the 6×6 paper pad, glitter Thickers, and stickers. 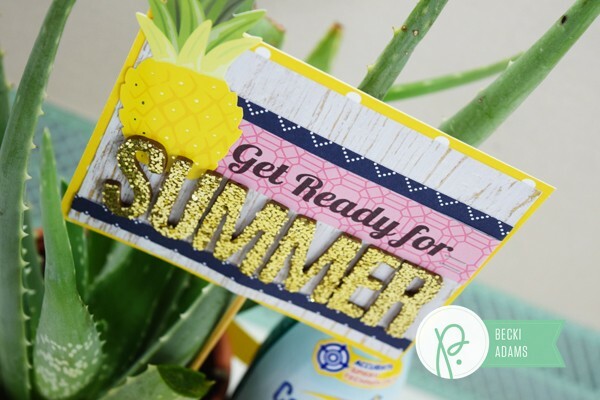 The “get ready for” portion of the tag was printed on my home printer on a scrap of pink patterned paper. I added the tag to the pot with a bamboo skewer. It’s so hard to get a good photo of glitter, but this tag looks adorable with the glitter Thickers. I hope I’m not the only one that would be thrilled with a gift like this. I think we can all relate to getting a little too much sun when summer arrives. Would you love a gift like this? Hello friends! 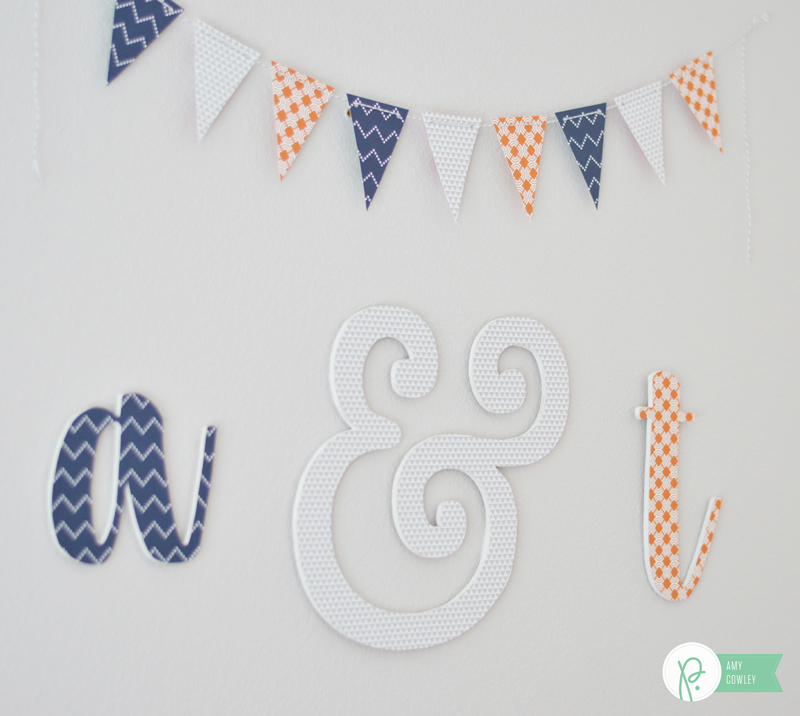 Amy here today from The Happy Scraps, and I’m so excited to be sharing our DIY Master Bedroom Decor with you today. We recently moved, and we have a lot more space do decorate now. Where we lived previously, we didn’t really have a color them or anything for our master bedroom. 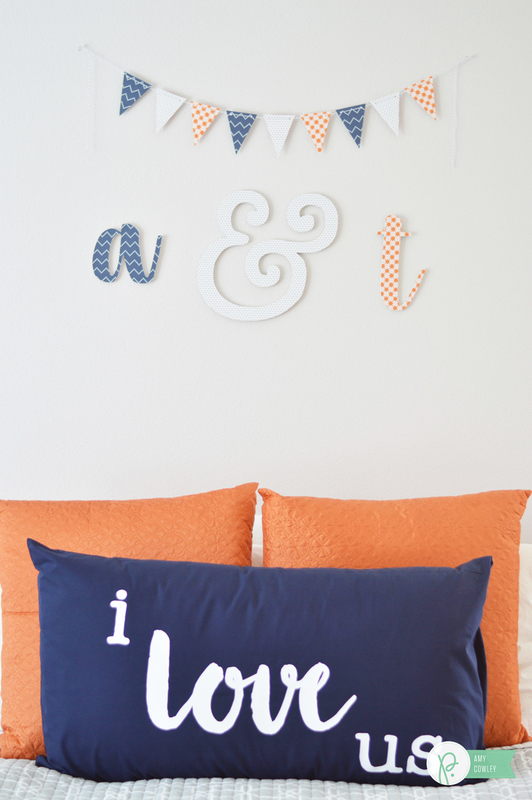 Since moving, I’ve decided that I want to use the colors gray, white, orange, and navy in our master bedroom. When I saw that the Jen Hadfield Everyday Collection had these colors, I knew I had to do something with them for our bedroom! I wanted to make something to go above our bed, on the wall. 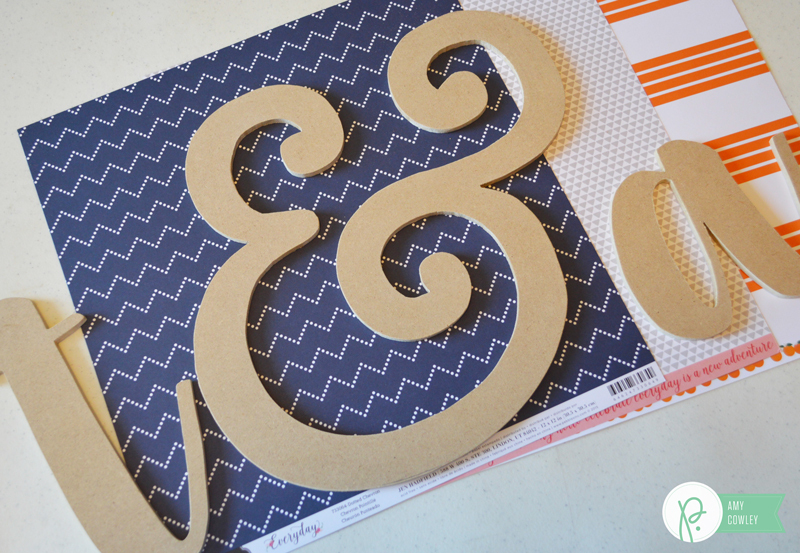 I decided I’d cut out some wood shapes to apply paper to. 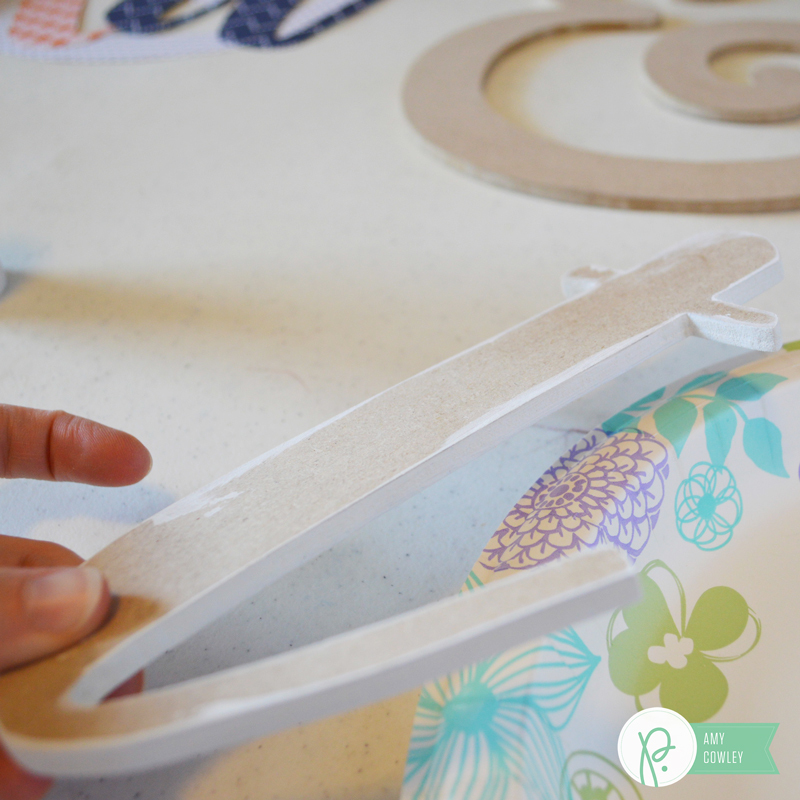 Once I had the wood cut out, I traced my shapes onto the back of the paper I wanted to use. Then I cut out the paper. I painted the edges of my wood white. I like to do this after I trace the paper, so I don’t end up with a pencil line showing on my paint. 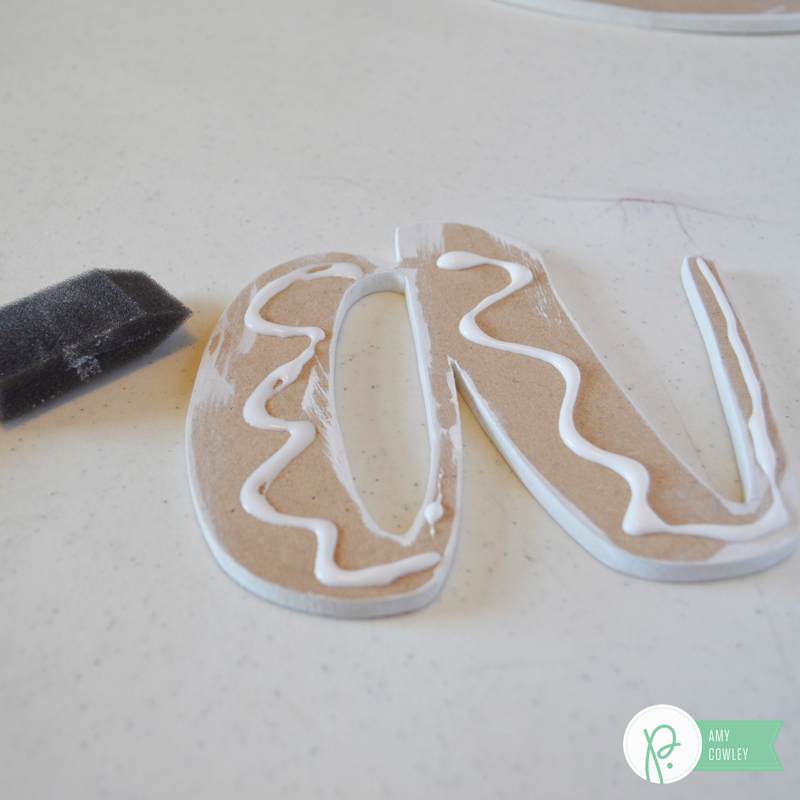 Using wood glue, I spread some onto my wood. I spread it out with a sponge brush, then applied my paper. I smoothed out the paper well, making sure it was stuck to the wood really well. 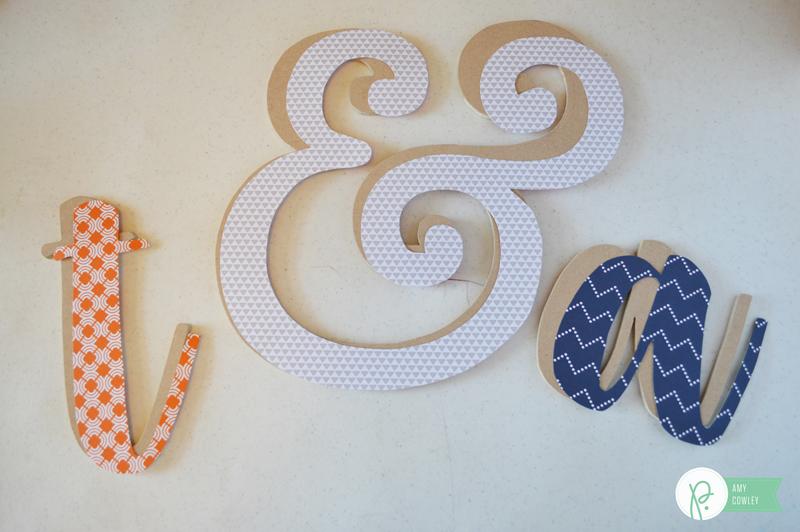 Once I had all my wood letters and shapes finished, I decided I also wanted to add a banner to hang above the wood on the wall. 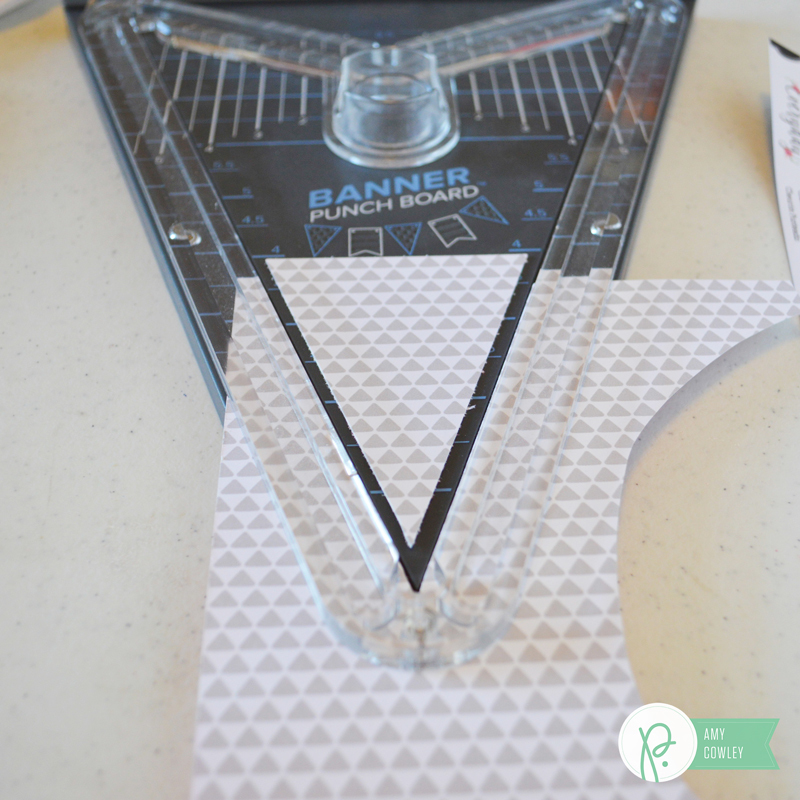 I pulled out my banner punch board and had it put together in no time. After I punched the holes in the top, I used baker’s twine to string the little triangles together. Then I hung them on the wall. I’m so giddy over how it all came together and turned out! What kind of decor do you have in your master bedroom? 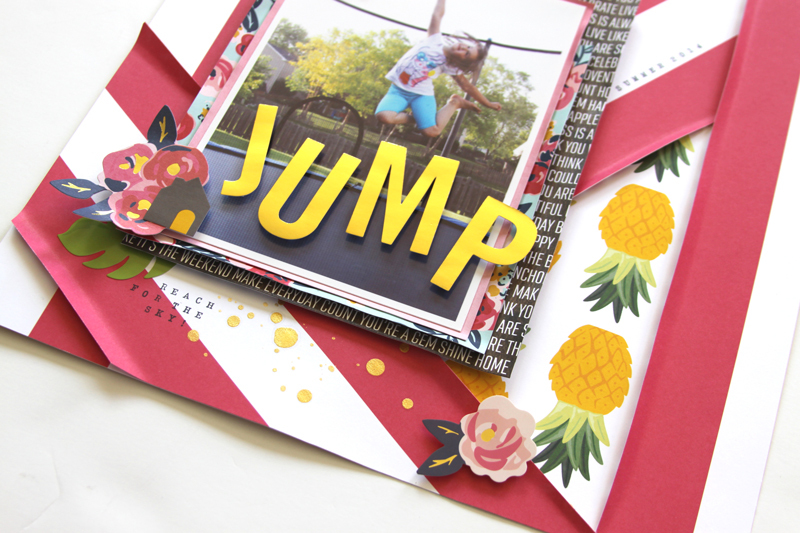 Hi, Renee here to share a playful Jump layout using the Jen Hadfield Everyday collection. The colors in this collection went so well with the colors in my photo. In between these spring days filled with rain and snow flurries (what?! ), the girls have been able to go outside in the backyard to enjoy the beautiful weather and play on their trampoline. 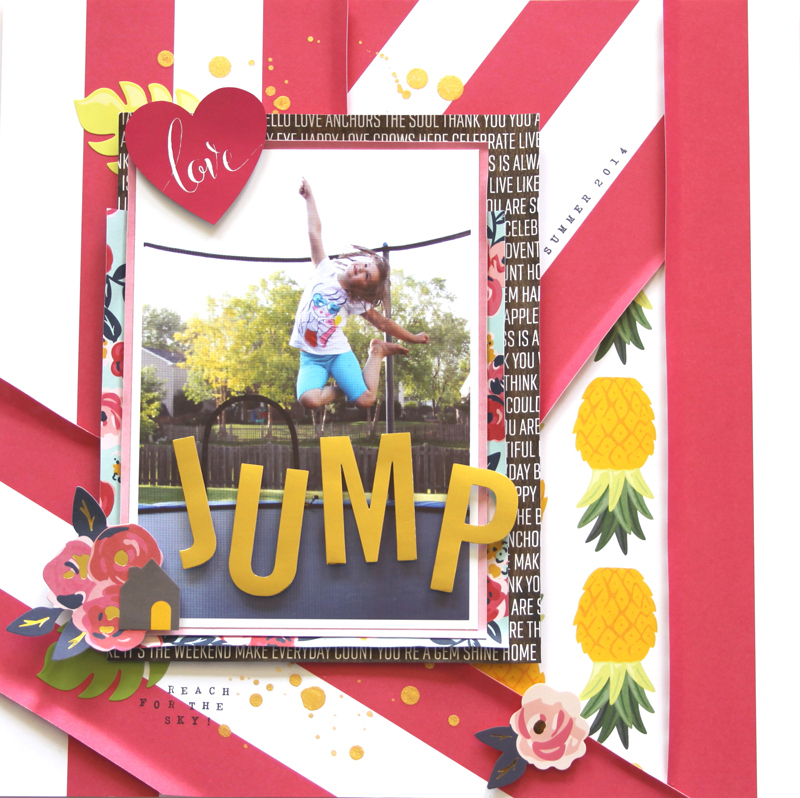 For this Jump layout, I used a photo that I have always wanted to scrap but never got around to it until now. I love this photo of Payton! She is quite the jumper. Not at all surprising. Ha! This photo measures 5″ x 7″ plus a border. I really LOVE the space between her and the trampoline, because it makes a perfect spot for my title. I used the Large Gold Alpha Stickers and made my “JUMP” word jump right along with her. 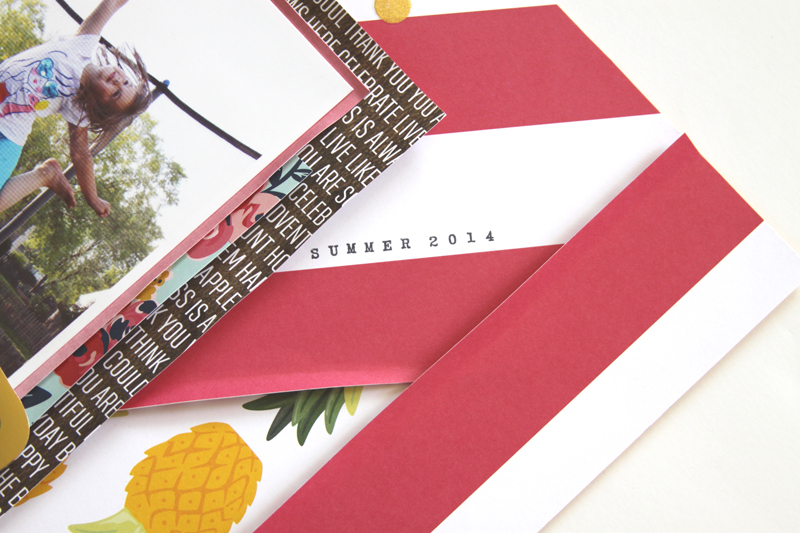 I used the Pineapples pattern paper for the background of this layout. 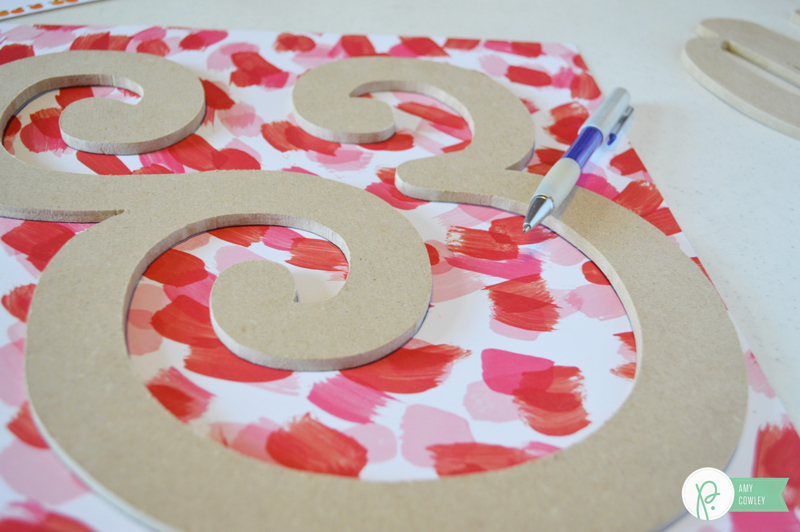 I used the pink stripes from the Trellis pattern paper to create movement around my page. Love the gold splatters above and below my photo. I added layers underneath my photo using the Pretty Peonies (measuring 5 3/8″ x 7 3/8″), Floral Skies (measuring 6″ x 6 ½”), and Angled Thoughts (measuring 6 ¼” x 8 ¼”) pattern papers. 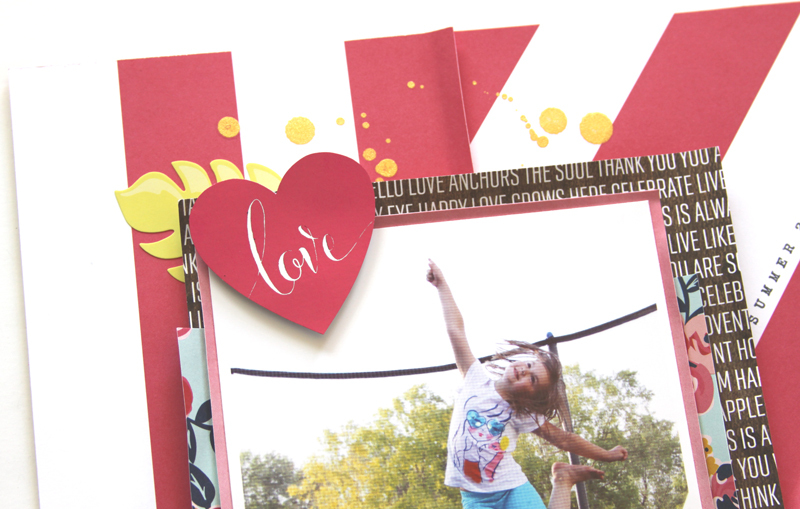 I cut out the “love” heart from the Minc Card Set after adding Hot Pink foil to it and added it to my page. 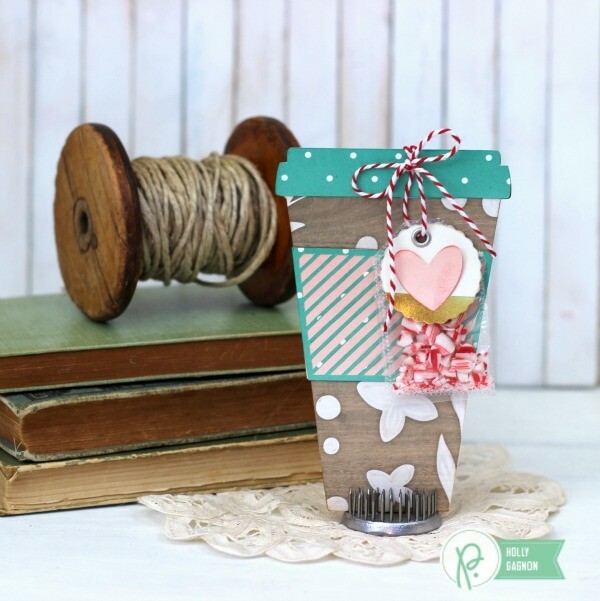 I used the Roller Stamp to add a bit of journaling onto my page. 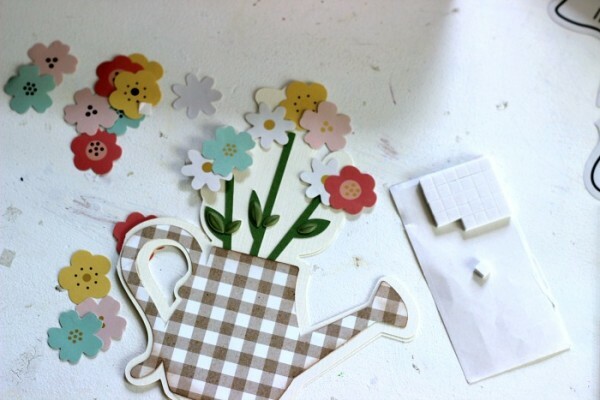 I added a die-cut flower, an adorable house sticker, and leaf stickers onto my page. I added another flower sticker along a stripe. I love seeing these pineapples on the page. Fun and yummy! I hope you enjoy my process video for this layout. 🙂 Happy Creating!